- Available for slot 6, 8, 10. - Robust construction to handle high force. - Can be fixed in strut profile and even in wire grille with the clamping element. Banking on the skills of our qualified team of professionals, we are involved in providing high quality range of Edge Profile Handle. We have carved a niche amongst the most dominant names in this domain, engaged in offering Door Handle. We are one of the pioneers engaged in exporting and supplying a wide gamut of Main Door Handle. These are being made of graded stainless steel. Our handle and knobs are suitable for the glasses of different dimensions. It is offered in matt or glossy finish that adds superior look and elegance to the products. 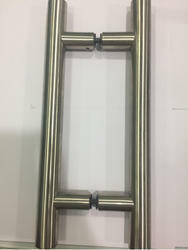 We are a unique name in this industry to provide our prestigious clients an exclusive range of Aluminum Door Handle.